On an ongoing basis, I lead workshops + presentations about creating remembrance ceremony or ritual and caring for our own as a natural extension of hospice. I offer these in one-hour or three-hour formats for various community groups, interdisciplinary hospice teams and faith communities. It is a joy to develop new outreach and educational opportunities throughout Tucson and greater Arizona. Please contact me at 520-609-8396 if you are interested in collaborating and/or bringing a presentation or workshop to your community! Saturday, September 27th at Bean Tree Farm in Tucson, AZ: Join me and Cindy Whitehead for an Intensive about understanding choices and preparing for the continuum of actively living into dying with awareness. This will be fun AND delicious! During this intensive, we’ll explore choices, seed ideas and preparatory steps for making a natural death possible. Eighty percent of Americans say they want to die naturally in the comfort of their home, but less than 20% of us do. Knowing our choices and putting those into action when appropriate will help reverse this ratio. We will cover ways to reflect on what natural death means for ourselves, hold conversations with our closest relations and then document and convey our final wishes. We’ll also explore how caring for our own at home after death is possible. This session offers a simple premise: our dying, death and after-death continuum is part of the natural cycle where we may find connection with each other and the earth, rather than feel separated and commodified as is the norm in contemporary culture. Cost for this includes a hearty main course salad, delicious desert snacks made freshly at Bean Tree Farm and refreshing desert drinks. Death Cafe participants enjoying food and company at the May Special Edition: Higher Pyre. 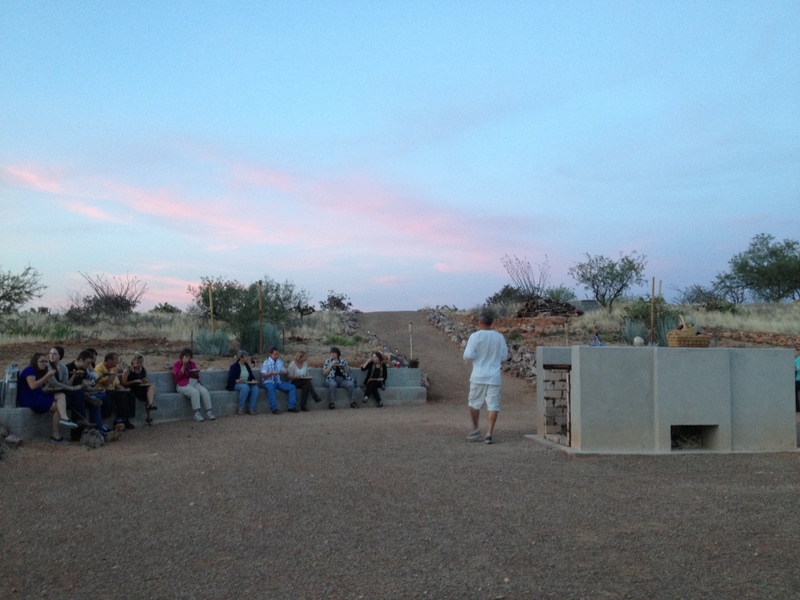 In the Fall of 2012, I initiated the First Friendly and Fearless Tucson Death Cafe with friend and colleague Cindy Whitehead. As a thread in a greater global movement, what an amazing ride our Death Cafe proves to continually be! We gather at Death Cafes primarily to affirm life. We also drink tea, eat delicious food and have safe + meaningful conversations about death and dying. For the first five months we met in the Community Room at Bookman’s on Grant/Campbell. Incredibly, we outgrew the space. We also met at Monterey Court Cafe and Galleries for awhile, what a great community resource! NOW we meet at Big Moe’s Coffee Emporium in the Metal Arts Village on Dodge just north of Fort Lowell, every first Tuesday of the month from 6:00-8:00PM. Depending upon weather we meet both inside and on the outside patio spaces. For more information, please visit our Facebook Page or Cindy and me at 520.329.3724. Upcoming 2014 Tucson Death Cafe dates: September 2nd, October 7th, November 4th and December 2nd . 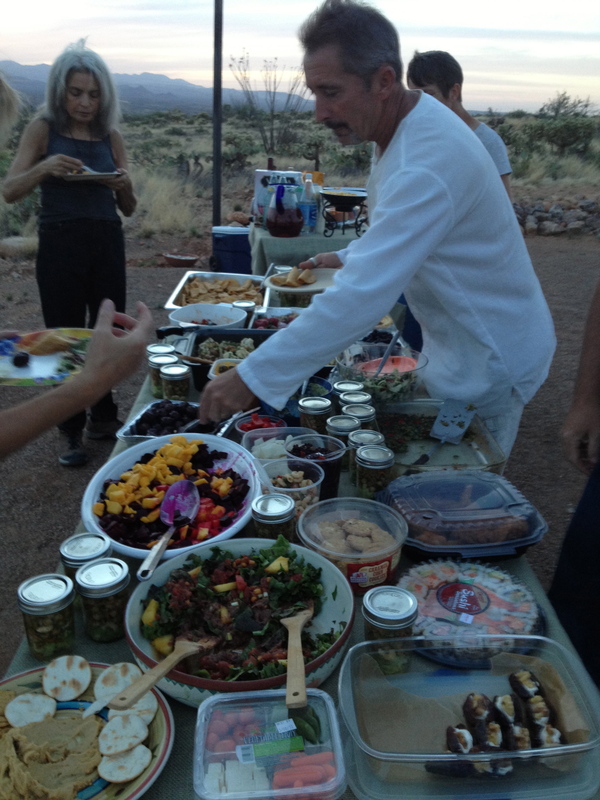 Incredible food and new friends at the May Tucson Death Cafe Special Edition: Higher Pyre. May: Showing of the film “A Family Undertaking” at lunch time meeting of social workers, nurses and spiritual care providers for Casa de la Luz Hospice in Tucson. September: Collaborative workshop on “Caring for our Own” with Jeremy Werner at Caritas Center for Healing on 9.29.13 from 9:00AM-Noon with optional lunch from noon to 1:00PM. Gathering resources for alternative disposition like green burial and open-air cremation. October: Led Ceremony Discussion group at the Third Annual Conference for the National Home Funeral Alliance.